dgpcolorado wrote: Is the Soul really in the compact car class? It seems bigger in the pictures (I've never seen one in person before). The Soul is about a foot shorter in length than a Leaf, but the other exterior dimensions are similar and the interior specs are pretty similar as well. tractioninc wrote: ...Now that I've put over 500 miles on my Soul I've started exploring its limits more (acceleration, braking, cornering, top speed, etc). It's proving surprisingly capable compared to other gas-powered compact cars I've driven hard. Is the Soul really in the compact car class? It seems bigger in the pictures (I've never seen one in person before). The footprint of the Soul is very small but the styling and height throw off perceptions. It's 16" shorter than a Honda Civic. It fits nicely in compact parking spots. GRA wrote: For me and I expect most people, it's just the opposite. I prefer a hard, guaranteed number to a 'maybe, under this, that and the other conditions' number. A pessimistic number will make people (like my wife) get more range anxiety and perhaps use the Leaf less. I'd caution against generalizing your perception as that of "most people". My guess is - most people keep a buffer i.e. they want to see on GOM x+20 miles (or some other number) if they have to drive x miles. That buffer will take care of the variability. dgpcolorado wrote: Not necessarily. Even with terrain and speed adjustments the algorithm still won't account for changing weather conditions. Ofcourse future can't be predicted with 100% accuracy - but like weather forecasting it can get more and more accurate. For eg. use history to figure out the speed driver uses (above/below the speed limit). Look at traffic for current conditions etc. I think most people prefer a 'real' number, even if pessimistic, to a 'highly variable and maybe attainable provided you've read all the manuals and used all the tricks' number provided by most GOMs. Early adopters, being more interested in the tech and more technically inclined, are more likely to push the limits, but the average A to B commuter doesn't care what's under the hood or how the number's arrived at, as long as they can count on it. They can then apply whatever amount of reserve to that number that makes them comfortable, and KNOW they'll be able to go that far with no worries, unless they decide to try and tow a space shuttle For a BEV, I want at least a 10% emergency reserve, and it could be more in inclement conditions. I believe Tesla allows you to set your own personal mileage reserve in the car, and subtracts that when calculating whether or not you have enough charge to make the trip. That's the kind of mental security that a pessimistic GOM provides - you can almost certainly go further, but you _know_ you can go that far. As to what 'most people' like, no one seems to complain about the Volt and Spark's very accurate DTE, and no one feels the need to call them GOMs. That's certainly not the case with the LEAF or other cars that use last few mile predictions. Without getting really fancy and using gps with topographical info and recording everywhere you drive and at what time you go different places (or forcing you to put an address in the gps) and pulling in real time weather data it would be really hard. After all that there would still be times it's off. 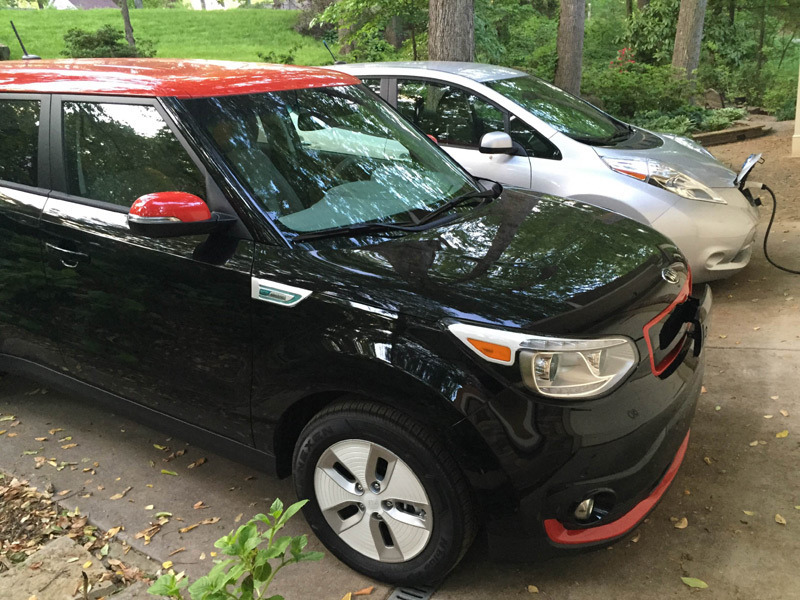 The best GOM I think is in the spark EV, it gives three numbers, a high and a low as well as a current driving style. Yes, I like the Spark too, as it gives the cautious, the average and the daring driver the information they want. More importantly is that GM apparently uses a rolling average over the past couple of hundred miles, thus evening out the wild swings that 'last-mile' GoMs like the LEAFs seem to use. Tesla is attempting the method in your first sentence. Presumably no one would bother to enter a destination for local trips that you know won't be a problem for you, so it's just for the edge-of-the-envelope ones (i.e. trips) that you'd care. 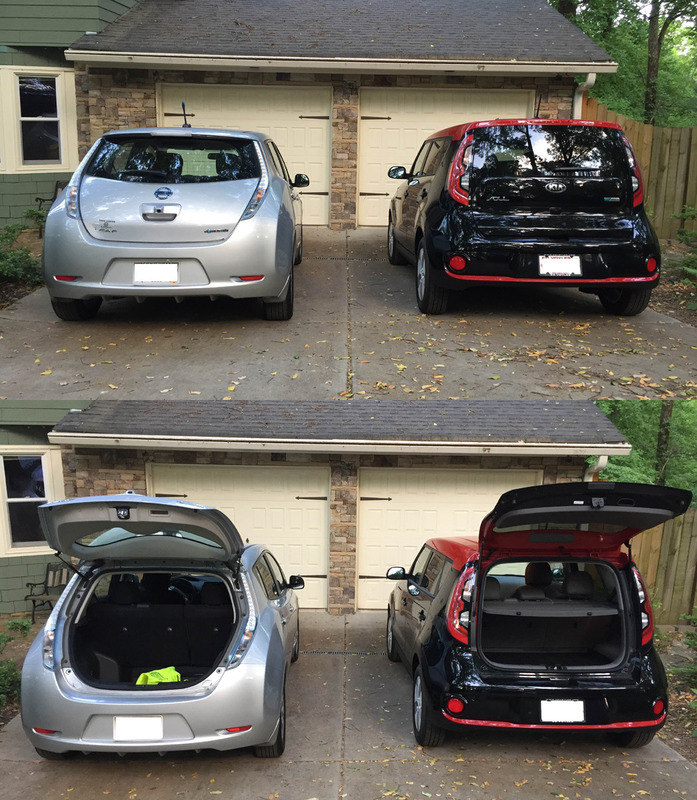 tractioninc wrote: We have both a 2014 Leaf SV and a 2015 Soul + EV in our driveway, so I will try to remember to take some comparison photos of the hatch areas soon. I find the cars to be very, very similar by objective measures. So close in terms of size, practicality, creature comforts, driving experience, etc., that the chief differentiator is the styling. Last edited by tractioninc on Mon May 04, 2015 7:23 pm, edited 1 time in total. You'll notice that the roof of the Soul is higher than the Leaf, but that's mostly due to the higher ground clearance. The Leaf is nearly a foot longer than the Soul, and part of length extends the floor of the cargo area. The floor of the Leaf's rear hatch is noticeably larger than that of the Soul and is deeper, too. However, the Soul's cargo area has a false floor to make the load area more even when the seat backs are folded down--removing that floor gives the hatch area about the same vertical height as the Leaf. It's noteworthy that the hatch space of the Soul is very rectangular, while the Leaf's space is almost wedge shaped due to the steeply sloping rear hatch. The result is the rear headrests are about twice the distance from the rear glass in the Soul than in the Leaf.